Next sunday, in many countries, it’s Father’s Day. So here is my contribution for that day. There is a technique here I use for toy photography, that is the black background in daylight. Yes, this picture was taken at noon without any background. The camera was set in manual mode. The speed was set at 1/250 with an aperture of f/32. This also allows me to have both faces in focus. As LEGO minifigures are plastic toys, a diffuser must be used to avoid reflection. The new Superman movie, Man of Steel, will be released on June 19th. As LEGO does have the license for this movie, they are offering under certain conditions the Jor-El promotional minifigure. Of course, this is an impossible illustration as Kal-El never knew his father. Well, lets see if we’ll see the Fortress of Solitude in this movie. So, who will be at the theaters next Wednesday? 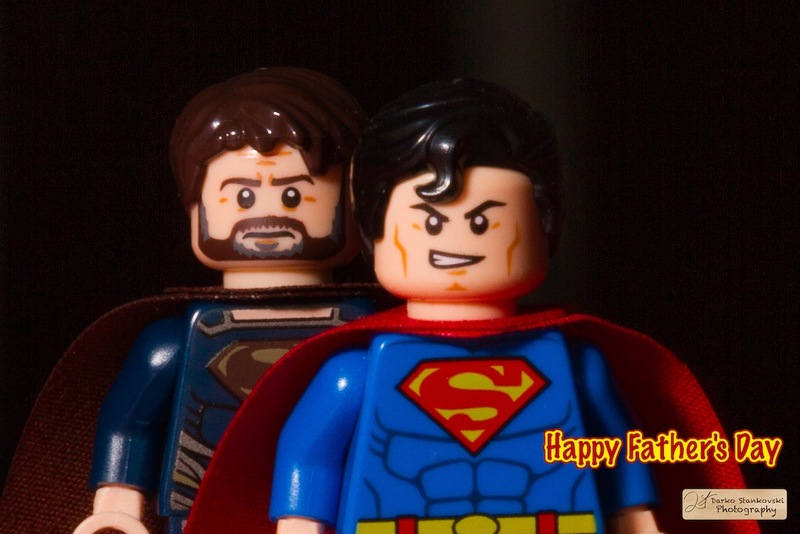 This entry was posted in Photography and tagged Jor-El, Kal-El, Lego, Man of Steel, Superman, Toy Photography on June 14, 2013 by Darko Stankovski.